time, you get the opportunity to hone your skills and create work that any budding artisan would be proud to call their own. I often explain to students that were you to buy the objects that you will make in this class, you would wind up spending almost the same amount without ever having gotten the experience of doing it yourself. And it is true. A handblown ornament made by a U.S. artisan approximately 5 inches in diameter easily sells for $24.00 in most galleries and boutiques across the nation. You will have the opportunity to make up to three of these during the class including a large suncatcher, which we were told were selling for $110.00 at a gift shop in North Carolina recently (these large suncatchers are slightly smaller than a soccer ball and work great in large sunlit windows and can be adapted during class to be used as a yard ornament on a copper holder). 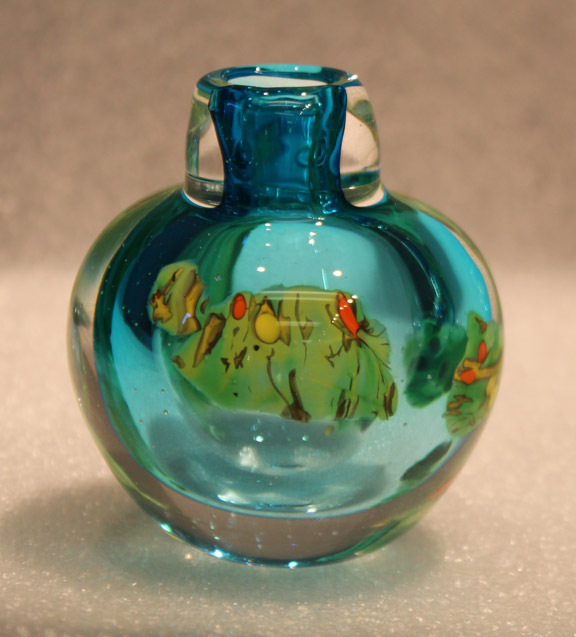 Paperweights range from a low of $75.00 on up to $200.00, for example. This is a great class for making truly one of a kind gifts as well as building skill in a once-in-a-lifetime opportunity. 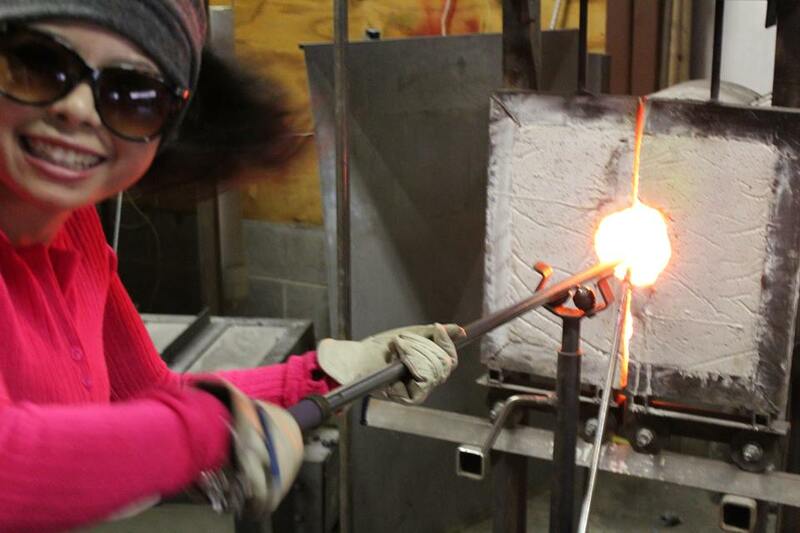 The Two Day Intensive Class at Stafford Art Glass is a stellar opportunity to immerse yourself in the art of hot glass in a fun and supportive environment. For beginners, there is no better way to satisfy your curiosity about this ancient craft that is part art and part alchemy! I pride myself on taking people who do not believe they have a creative bone in their body and showing them the rich potential that glass has for expression and creativity. When you consider that for a material that looks dazzling after it has been drizzled onto the floor, think what you can do when you apply some direction and burgeoning skill into the mix! We guarantee that you will come away absolutely amazed by the beautiful things that you will get to make. There is nothing in the world quite like glass for its color, brilliance, and expressive potential. So far, we have a long list of believers that are growing by the day. This makes glass an excellent material for teaching art and craft. You owe it to yourself to catch the wave that is glass and find your own creative inspiration! All materials, tools, and supplies are included for the making of the work you choose. All color that is currently in stock is available to students to use during the class. Shipping costs extra but is done so at cost. No packing charges are made for our students (only costs for materials and actual shipping costs for the carrier of your choice – USPS, FedEx or UPS). Lunch is provided by the studio both days. We make for our students a large hero sub on freshly made bread sourced from our local artisan bakery made with fresh ingredients with condiments of your choice to add. A variety of drinks are available from iced tea, water, juice, and soda from our local healthfood store. Fresh fruit is served for desert. Anyone who is vegan, vegetarian, or who has food allergies or sensitivities to certain food, should alert us and we will accommodate your request with an option agreeable to your needs! All food needs require three days notice prior to the start of class so our staff can make sure all necessary menu items are on hand and prepped for the day in question. The studio stocks a variety of healthy snacks for those who need an energy boost through any part of the day. These vary but may include protein bars like Cliff bars, nuts, trail mix, and fruit. The studio also has a shower for anyone who would like to dress out of sweaty clothes and get cleaned up. Towels are available for your use as well as several types of shampoo, conditioner and soaps. 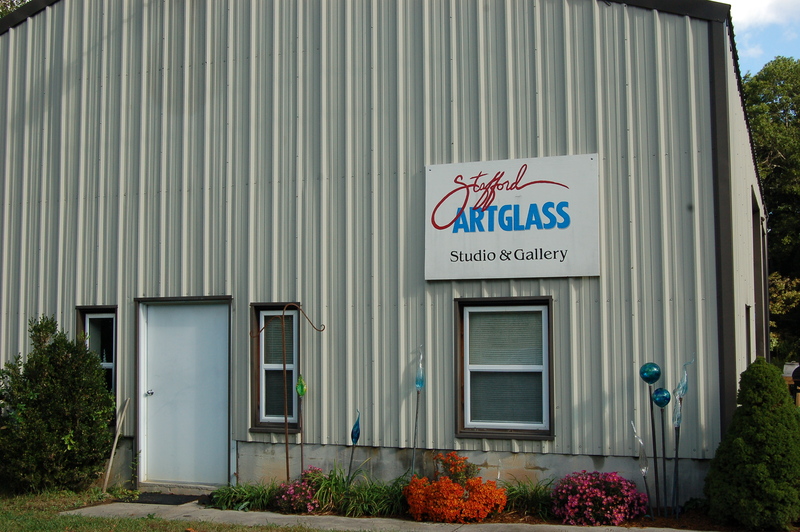 Classes at Stafford Art Glass begin at 9:30 and after introductions, the course begins with a review of safety guidelines and the tools and equipment used to make hot glass. After this brief introduction, guests are taken right into the making of their first object; the ornament and sun catcher. Each student learns how to gather glass from the furnace, shaping the “gather” and apply color to the clear glass coming from the furnace. The glass is heated at the reheating furnace, and, working together, the student and teacher work to blow the ornament or sun catcher ball. 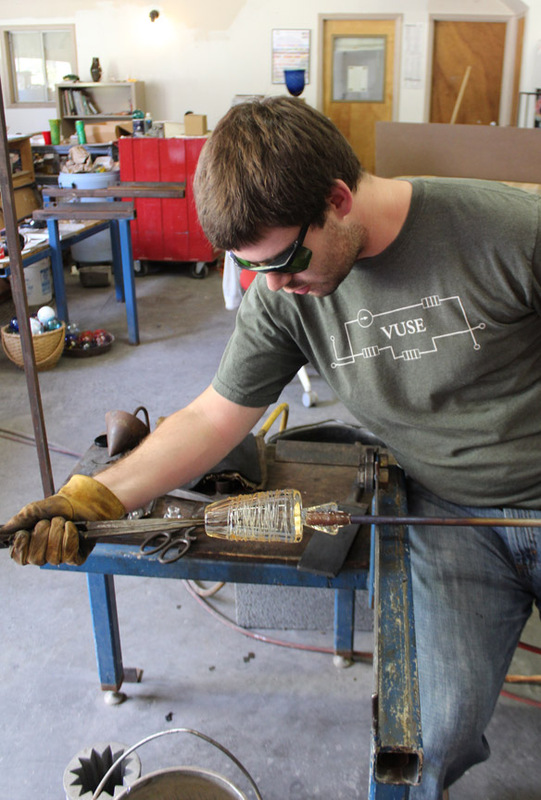 A hanger is then put on with hot glass and the piece is put in an annealing oven where it will cool slowly. The next piece is the paperweight, which will include all of the same color applications and shaping processes as the ornament but in a solid piece of glass. A wide variety of shapes have been made during these classes from egg shaped, spheres, and disks. There are a number of options available to students based on their interests. Normally we teach students how to make their own tumbler first in order to introduce them to the world of vessel making. It is also pretty cool to have your own drinking glass. It is after the drinking glass that we then focus on making bowls. A variety of techniques will be covered from frit application, color wraps, as well as optic molding for unique ruffled shapes. Normally all of this is accomplished the first day, although the course is paced to the students so sometimes we can move quicker or slower depending on how the day goes. By the second day, we are working either on bowls or beginning to work on flowers. We finish up the day with the option to repeat tumblers, bowls, suncatchers , paperweights, or to go on to make a small vase form. If there is time available students will be shown how to make a special art glass pumpkin (with unique colors and metallics utilized in the design). The class ends at approximately 5:00 p.m. each day. I say “approximately” because if necessary, we can stay longer to complete an entire rotation if we are close to getting everyone finishing up tumblers or bowls on the first day, or getting all objects complete for everyone on the second day. Me and my staff work hard to make sure that students who lose a piece on the pipe (rare but it can happen) get to make up the work so they get as many pieces completed as possible! Students continue to come out for these classes because of the broad range of possibilities provided. Students have a gallery and a working studio where work can be viewed in various stages of completion partly to see what is possible and to draw inspiration. All participants also receive 30% off all glass made at the studio in the gallery or in the workshop during their visit to the studio for the class. Regular retail cost: $475.00 per person. See us on Facebook (stafford art glass) or contact us directly to learn more about current promotions that can save you 50% and more on this class! All classes prepaid 14 days in advance receive a 4% discount. Requirements for classes are no open-toed shoes and all-cotton clothing. No synthetics should be worn. Wear comfortable clothes. Ages 13 and up may participate in our classes. Work made must be annealed and also finished and can be either picked up three days after the class, or we can ship your items to you. Each class requires a minimum of four students per class. We require two week notice for the scheduling of the two day intensive class. Purchase can be made with cash, check, or charge. Stafford Art Glass accepts Visa and Mastercard. Reservations for specific days can be made via email or phone by sending email to info@staffordartglass.com or text/call (540) 605-0034. Hours of operation are Wednesday and Friday 10-2 and 3-5 p.m. Saturday 10:00-6:00. Other hours are available by appointment and while we do not post Sunday or Monday hours, both days are available for classes. Normally the two day class is offered on a Saturday and Sunday unless otherwise scheduled. We can be your source for helping you find suitable lodging and if you are flying into the area. We can provide you with transportation to and from the airport as well as your hotel for an additional fee. There are a number of very nice local Bed and Breakfast opportunities in Giles County as well as franchise run hotels within half an hour drive of the studio. The studio is fifty minutes from the Roanoke Airport and twelve minutes from Blacksburg. The Daylong Intensive Class at Stafford Art Glass is an opportunity to immerse yourself in the art of hot glass in a fun and supportive environment. For beginners, there is no better way to satisfy your curiosity about this ancient craft that is part art and part alchemy! 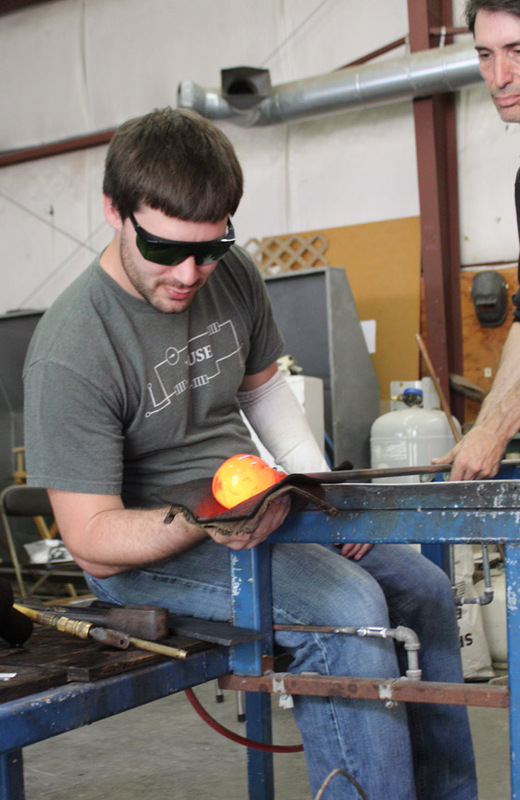 The course begins with a review of safety guidelines and the tools and equipment used to make hot glass. After a brief introduction, guests are taken right into the making of their first object; the ornament and sun catcher. 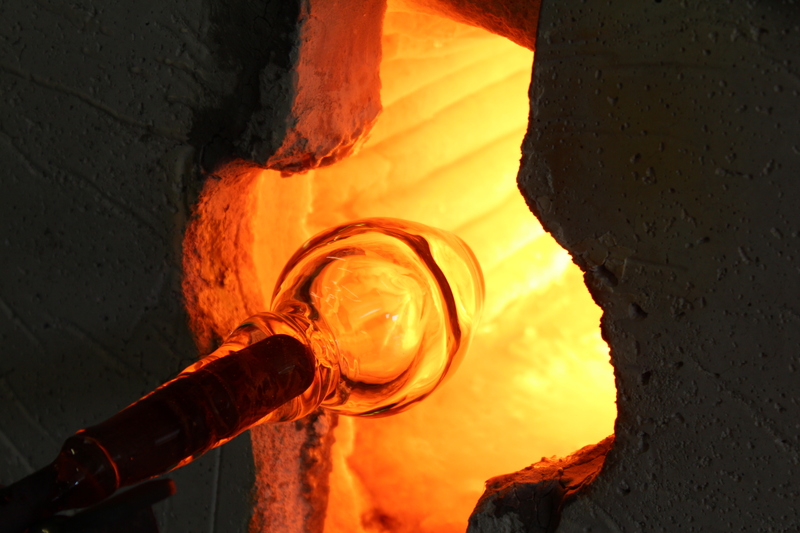 We work throughout the day on correct methods and techniques while also enjoying the process of creating beautiful objects in glass. 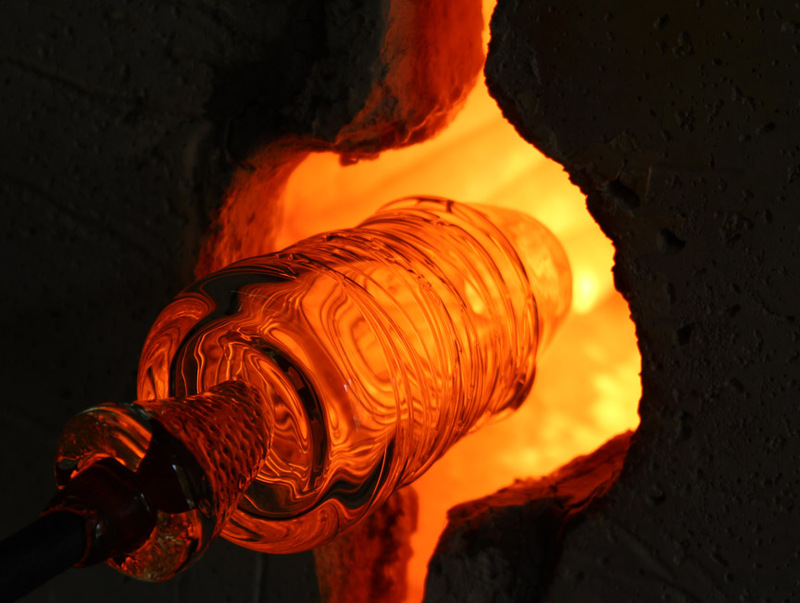 Each student learns how to gather glass from the furnace, shaping, as well as applying color to the clear glass coming from the furnace. The glass is heated at the reheating furnace and working together, the student and teacher work to blow the ornament or sun catcher ball. 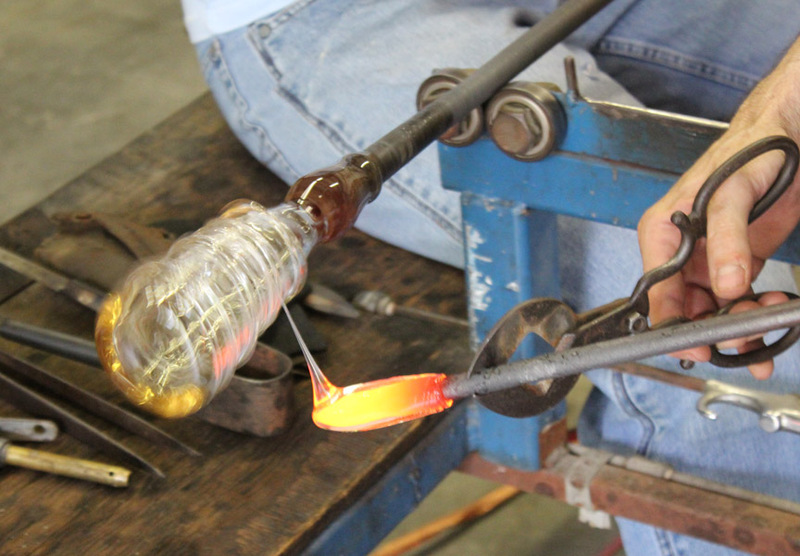 A hanger is then put on with hot glass and the piece is put in an annealing oven where it will cool slowly. The next piece is the paperweight, which will include all of the same color applications and shaping processes as the ornament but in a solid piece of glass. A wide variety of shapes have been made during these classes from egg shaped, spheres, and disks. We include techniques that include solid jewel colors, powder applications, and even cane work. There is a color palette available at the studio. There are a number of options available to students based on their interests. In some cases, flower have been made, in others we have worked on making tumblers. 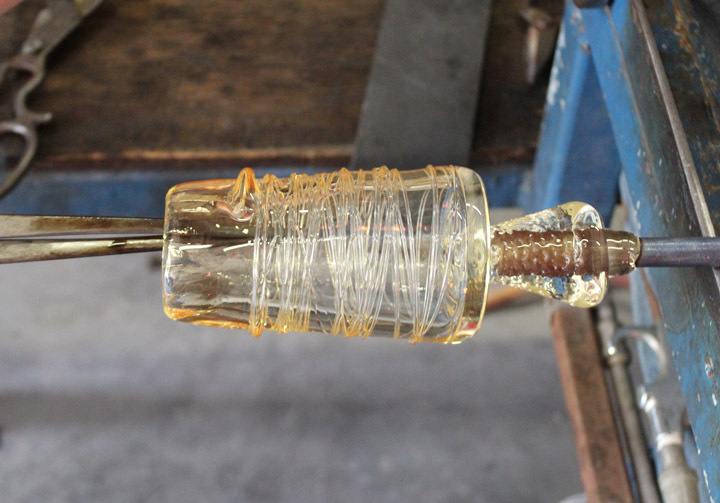 While tumblers take more time, they also provide the student with the widest range of skills for glassblowing and helps to set the stage for then learning how to make vases. Having your own drinking glass is also pretty cool. NOTE: Our weekend or two-day intensive includes these items while expanding the range of forms possible including sculptural glass, yard ornaments, bowls, flowers, as well as abstract sculptural pieces. Students continue to come out for these classes because of the broad range of possibilities provided. Students have a gallery and a working studio where work can be viewed in various stages of completion. All participants also receive 30% off all glass made at the studio in the gallery or in the workshop. There are also discounts available to groups who help us to set up classes by bringing friends, coworkers, and family. The cost for this class is $220.00 per person and has a four person minimum for forming a class. If you bring friends or family with y0u, there is a $30.00 discount available per person that you bring. You can keep this discount for your own or spread the discount to all other participants when coming as a group. Classes are considered a service and are not taxable, so you save an additional 5% when purchasing a class. If you are a student with a valid student I.D. you can save an additional 10% after all discounts have been applied. See us on Facebook (stafford art glass) or contact us directly for promotions for classes that can save you up to 50% off the regular list price for classes! Requirements for classes are no open-toed shoes and all-cotton clothing. No synthetics should be worn. Wear comfortable clothes. A long sleeved shirt over a t-shirt is advisable for maximum comfort. Ages 13 and up may participate in our daylong classes. Work made must be annealed and also finished and can be either picked up three days after the class, or we can ship your items to you. Stafford Art Glass provides bottled drinking water for all participants. Purchase can be made with cash, check, or charge. Stafford Art Glass accepts Visa and Mastercard. Reservations for specific days can be made via email or phone by sending email to info@staffordartglass.com or text/call (540) 605-0034.